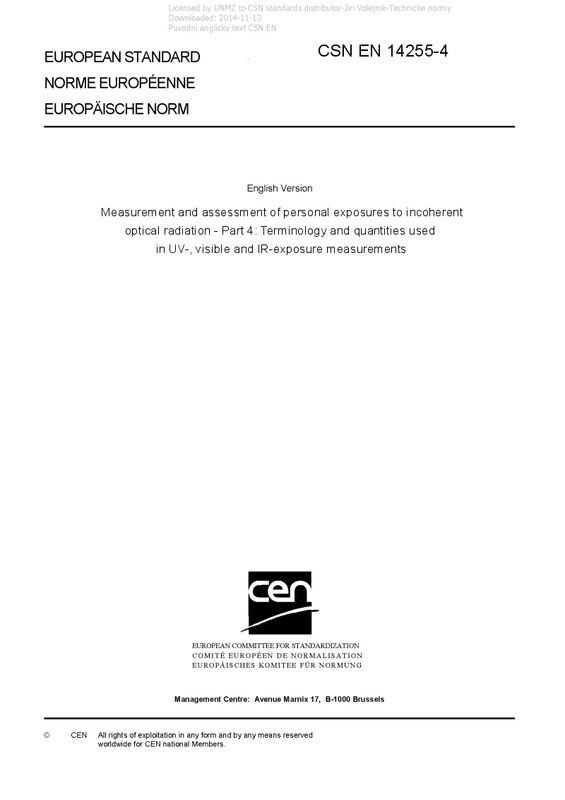 EN 14255-4 Measurement and assessment of personal exposures to incoherent optical radiation - Part 4: Terminology and quantities used in UV-, visible and IR-exposure measurements - This standard specifies the terminology and the quantities that are used in UV-, VIS- and IR-exposure measurements according to parts 1, 2 and 3 of EN 14255. NOTE Parts 1 and 2 were published in 2005, while part 3 is under preparation. This standard can also be applied to the terminology and quantities used in international recommendations from, e.g. ICNIRP, CIE, etc. The purpose of this standard is to unify the definitions of quantities for optical radiation measurements since inconsistencies occur between existing publications from different origins.